Today’s Mauerpark is located on the site of a former parade ground and, after that, a freight yard — evidence for which can still be seen in the Gleim Tunnel, an underpass beneath an unused rail bridge. Another relic of this time is the cobbled road of Schwedter Staße, which runs through the length of Mauerpark and forms the park’s main path. After the the Second World War, the freight train did not go back into use and the area was converted to an industrial park. The Berlin Wall (or “Mauer”) was erected in 1961 and, between the main wall and the rear wall, a wide strip of sand was put down to inhibit those trying to flea East Berlin. In 1988, a new main was built further to the west, while the old one was not taken down. There were, therefore, three walls by the time the Mauer fell. 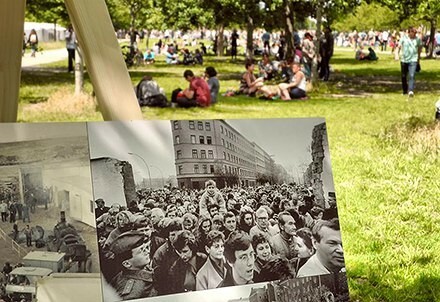 After the fall of the Berlin Wall, wild vegetation began to take root once more: meanwhile, masses of people came together to plant trees on Falkplatz and the hill next to the stadium. Residents of Prenzlauer Berg and of the Brunnen neighborhood successfully established the area as a recreational space. In 1994, thanks to the financial support of the Allianz Environmental Foundation, the eastern two of the four planned sections of “Mauerpark” were completed. The completion of the park, however, was then repeatedly postponed, since there were insufficient funds to purchase the western area. A fence between the commercial areas, which with the exception of the flea market is no longer rented out, continues, in its way, the history of borders and divisions on this site. Today, the completion of the western portions of Mauerpark is being negotiated politically and planned through the Bürgerwerkstatt.